I’m still in the middle of clearing through unfinished sewing projects. Whilst it is proving hard to knuckle down and get on with this, I am gaining an enormous sense of satisfaction from it. There is just one blouse that I am going to leave, as I don’t have enough experience with expensive silk satin sewing, and I really need to work out a few options for it. In the meantime, I finished up two knitting projects, completed another two and have another on some needles. I’m really coming along with my knitting skills, and I feel like I’m learning more and more all the time. 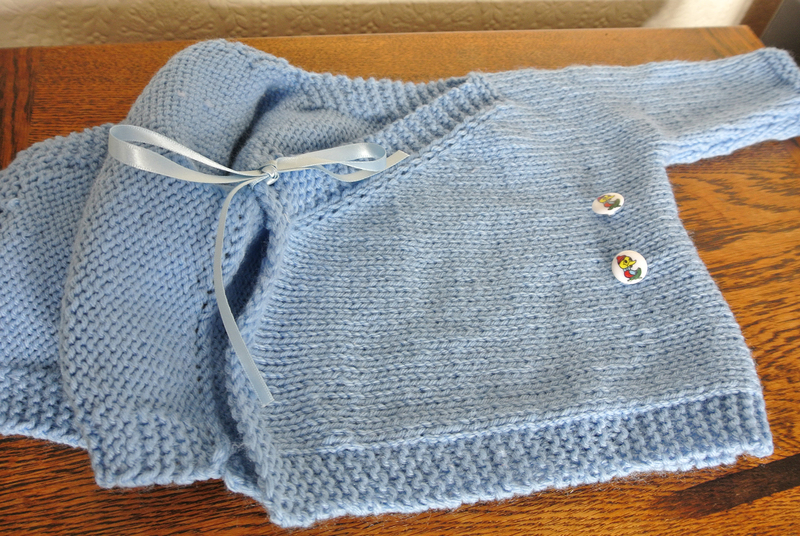 Most of my projects have been baby knits, which are brilliant practice as they’re so small. They are relatively quick and satisfying to knit. There is one tiny mistake on this, on the garter stitch band. I wasn’t paying attention and ended up with a gap in the pattern. I decided to leave this and move on, and I’m hoping that the little baby won’t be too fussy about it. 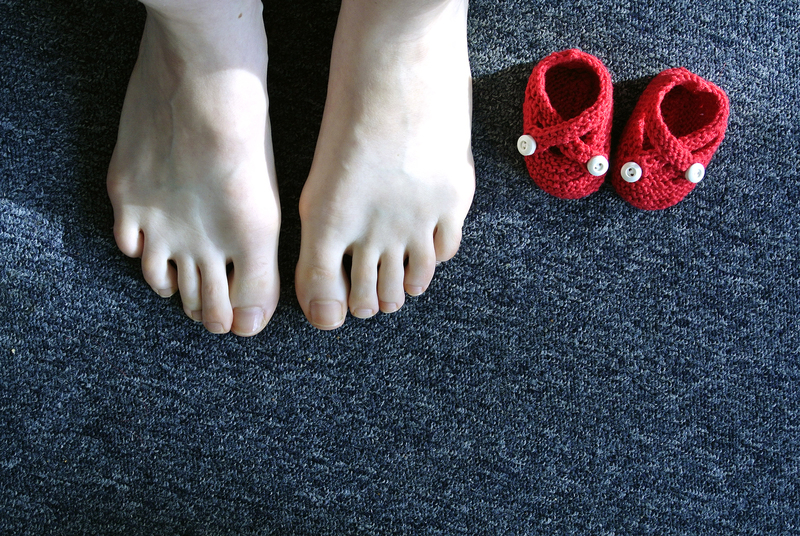 It’s knitted in an acrylic ‘baby snuggly’ yarn, DK weight. It took me about two weeks of very occasional knitting to complete. It was the first thing I’ve ever blocked, which turns out to be such a nice thing to do. 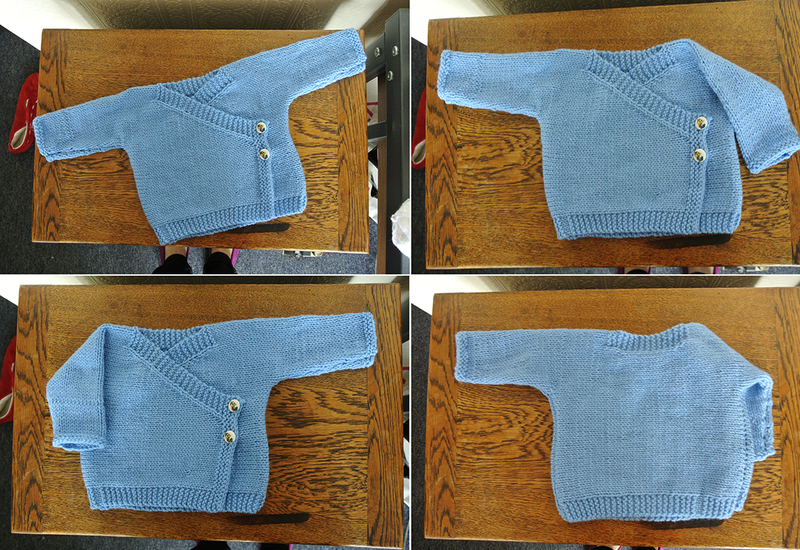 It really helped flatten out the knitting and overall give the cardigan a nicer, more professional finish. 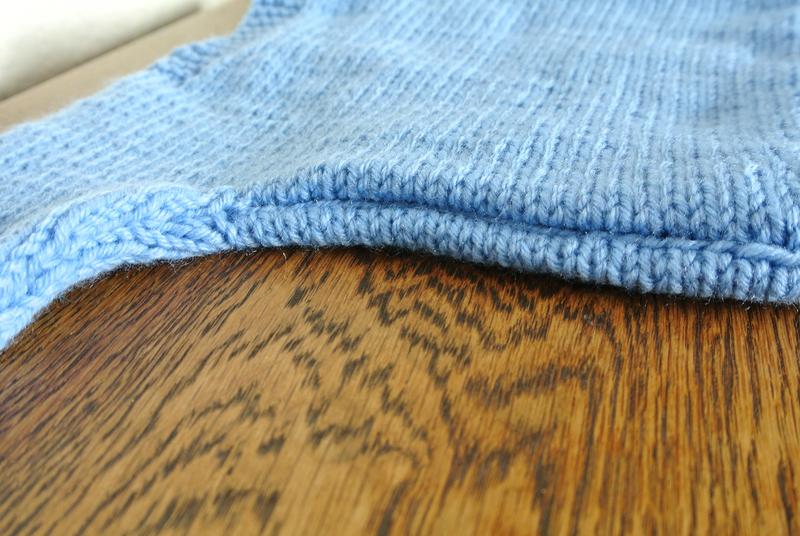 I still need to work on my seaming though! …and it fastens with an additional tie inside. The second (and most fun!) 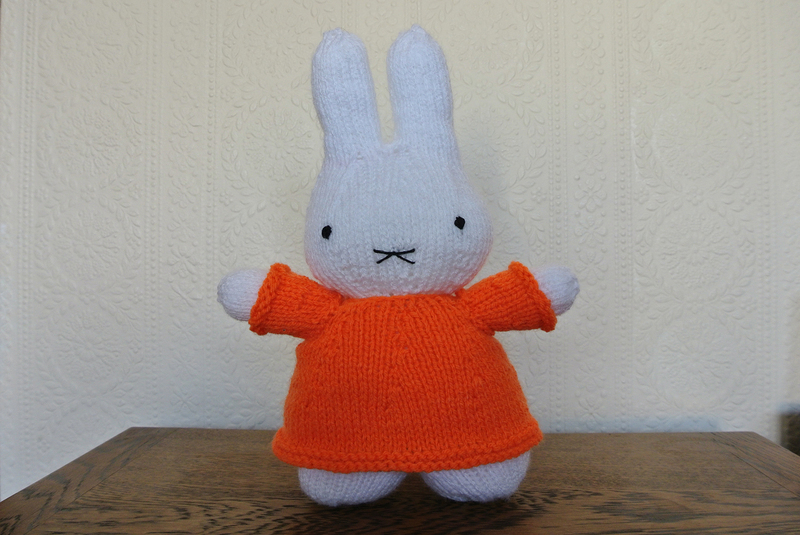 project I finished was a knitted Miffy. This was a lot of fun to make, and taught me loads about DPNs and sewing knitting together. I had originally started knitting the orange dress months ago and then put it on the back burner in favour of a jumper that went wrong. In my efforts to finish projects before moving on, I picked this back up after the kimono cardigan above and swiftly finished it up. 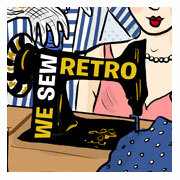 The head, body and arms are all made separately and then sewed together. Making the arms was very hard, as was separating out the ears. I didn’t really understand a lot of the pattern at first, but as I worked through it, it made more sense. 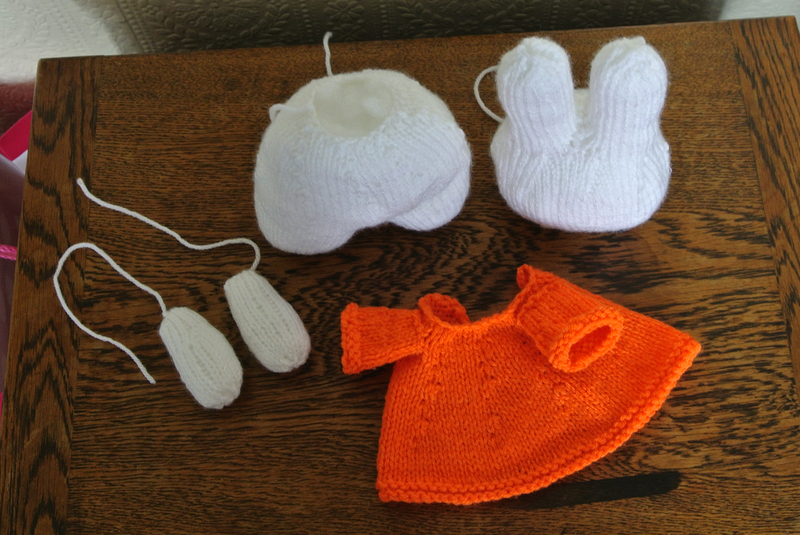 Seriously, of all the things that would teach me useful practical knitting skills, I wouldn’t have thought it would be Miffy. The pattern is from knitterbees. 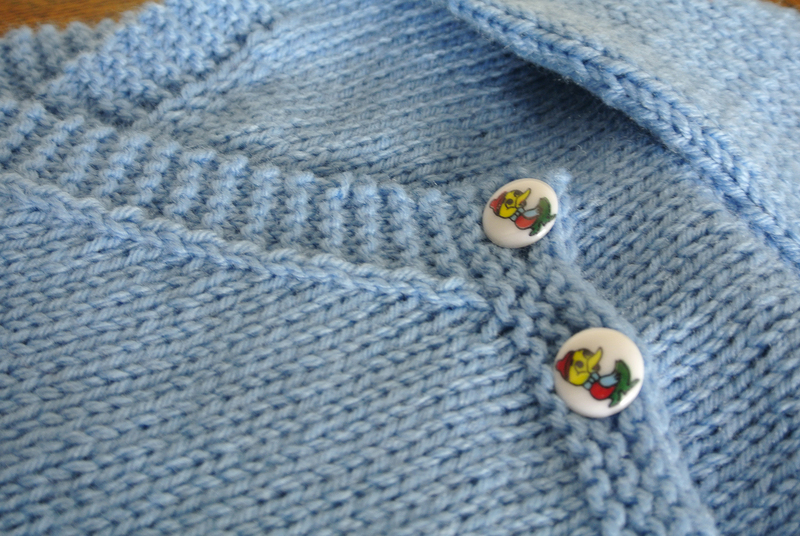 The yarn is acrylic, and the eyes and mouth are embroidered on, rather than buttons. I wanted to work outside of the tried and tested bootie realm, so I went with Saartje’s bootie pattern, a really sweet double strap number. 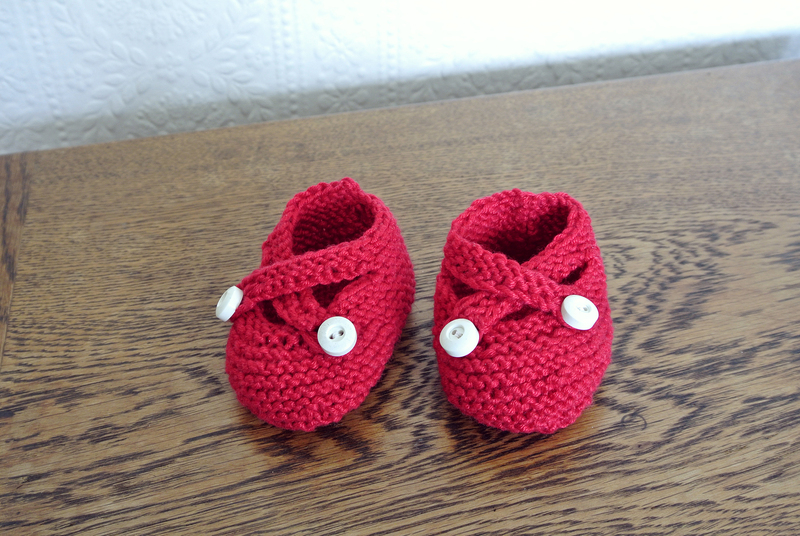 These were really quick to knit up, I finished one whilst watching a film, and the other the next afternoon. I plan to make some more booties for the impending arrival, but using the duck buttons I’ve got leftover from the cardigan. What I just can’t get over is how tiny they are. I’ve already got a nephew, so you’d think I’d be used to this. The wonder of human reproduction, eh? It seems quite a few people are getting into knitting right now. Has anyone else been super productive (apart from Tybalt)? As a side note, English readers should check out this BBC documentary about the history of knitting in the UK. As ever with BBC documentaries, there is a bit of filler, but on the whole I found it fascinating, and quite heart warming watching the old ladies knitting and talking about yarn. In the time it took me to write this, resize some pictures and post it, this documentary has gone. Sorry guys, it was from the Fabric of Britain series. Thanks for the shout out! I LOVE those booties, how cute are they? And that cardi is lush, I think your seaming and finish are great (I can’t see any of the mistakes that you mention) My miette cardi is coming along, slooooowly! How is the Miette? I’m currently working on a Chuck sweater – her patterns are really easy to understand. Nawwwww cute! These are lovely. 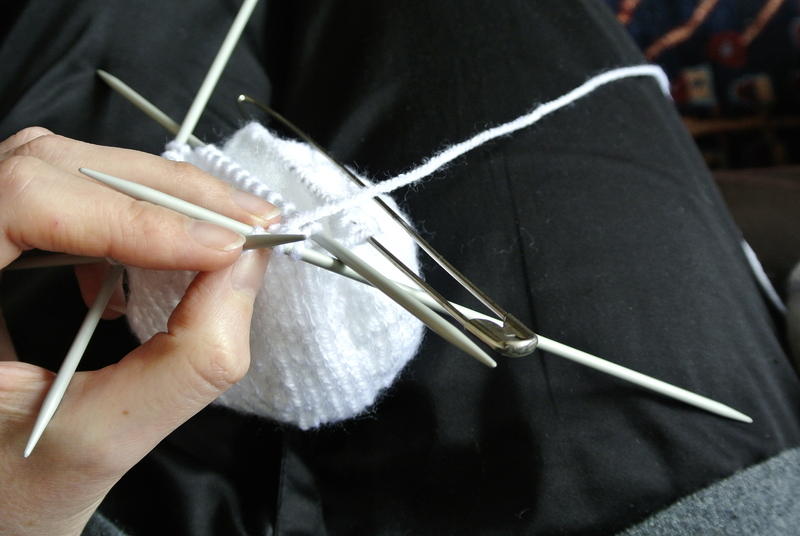 You’re right too, practicing on baby sized items is a great way to get the knitting skills up. I’ve been on a bit of a roll, 2 cardies (for me) in about 6 weeks! Love your knitting efforts, they look great. No way! You have lightening fingers! Wow they look great! I love your Miffy, I’ve recently finished a knitted dinosaur :) and almost a sweater and a cowl, I love how portable knitting is!